I have been lusting after farmers’ markets. Cooped up and shivering in the house, the grey, snow-filled clouds filling the sky, I have been browsing my old blog posts, reminiscing on the abundant produce that served as the base of my summertime recipes. I miss those days. What is so beautiful about nature, is that those days are not lost. They will come again. Sunshine, growth, new beginnings, warmth, freedom. The welcoming arms of spring and summer; I cannot wait to run into them. Me being me, I subscribe to the newsletter of my local farm. Recently, they announced that their asparagus will be available in early April. Which is only one measly month away- gasp! I cannot wait to run down and buy armfuls of the tender, earthy spears. It seems like we just have to get through these last few freezing, bleak days. I can just imagine those little green spears starting to grow through all of this ice and wind, and remain calm. Spring is coming. This recipe is an in-between of spring and winter, in my opinion. Fresh herbs = springtime, while the pantry staples of sun-dried tomatoes and chickpea flour = winter. 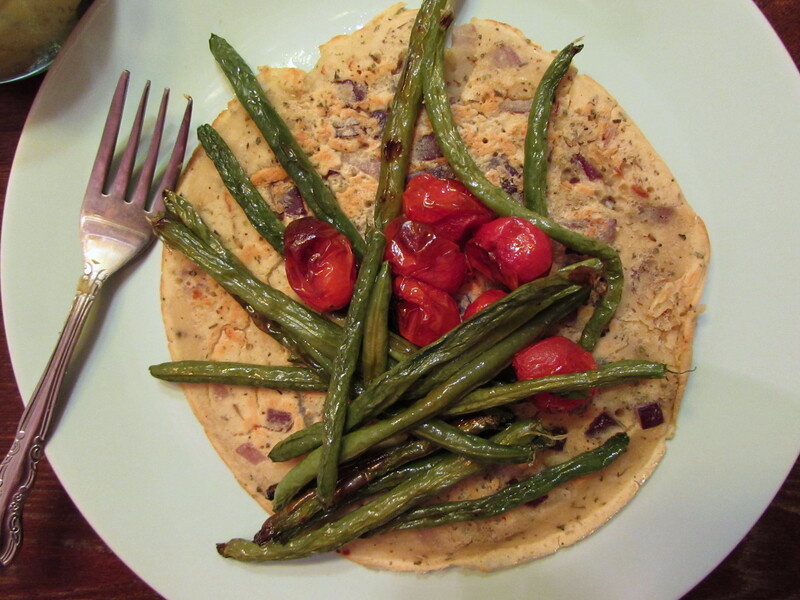 Socca is a large chickpea pancake that is traditionally eaten in the south of France (and Italy, too, but under the name of farinata). I had it when I was in France on a class trip ten years ago, served on the side of a road in Nice. Big geometric hunks are served piping hot out of an oven, and eaten as you stroll. David Liebovitz goes into this food tradition in much more vibrant detail on his blog. Ah, reading his blog makes me wish I just up and high-tailed it to France. I have been seeing riffs of socca scattered around the health blogosphere over the past few years. Ultimately, I modified Angela from Oh She Glows’ recipe, as a) she is my favorite cook / blogger, and b) because it had less oil than other recipes. (I knew I’d be slathering on mounds of tahini-rich hummus). 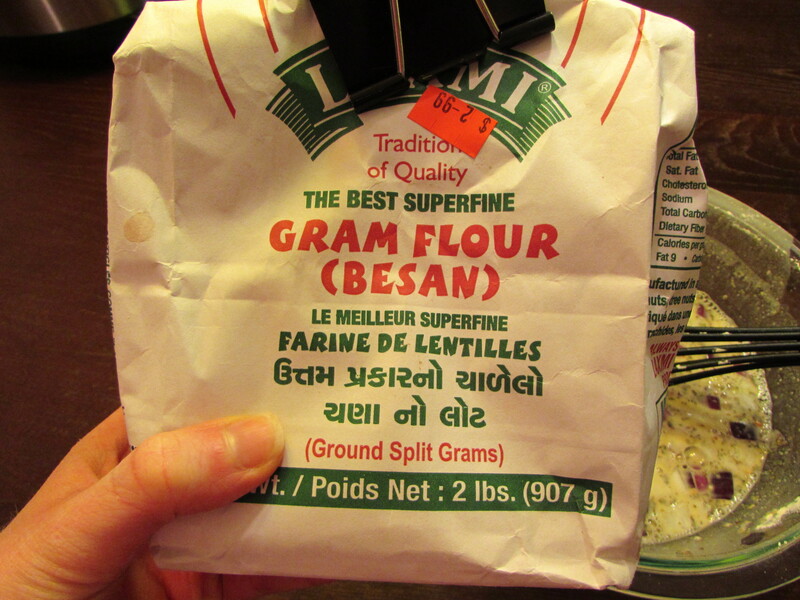 The bag above is the chickpea flour, or besan, as it is referred to in Indian markets. You can also purchase your chickpea flour in the health food section of a regular grocery store. Bob’s Red Mill, per usual, is a good purveyor. 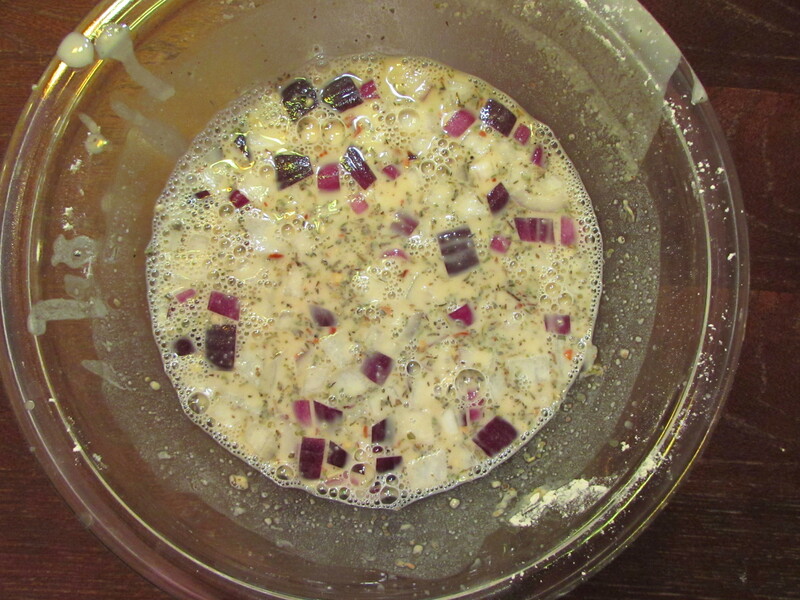 I changed Angela’s recipe by adding Italian seasoning and red onions, and removing the red pepper. This hummus will blow your socks off. The boyfriend and I may or may not have eaten it all in one sitting. 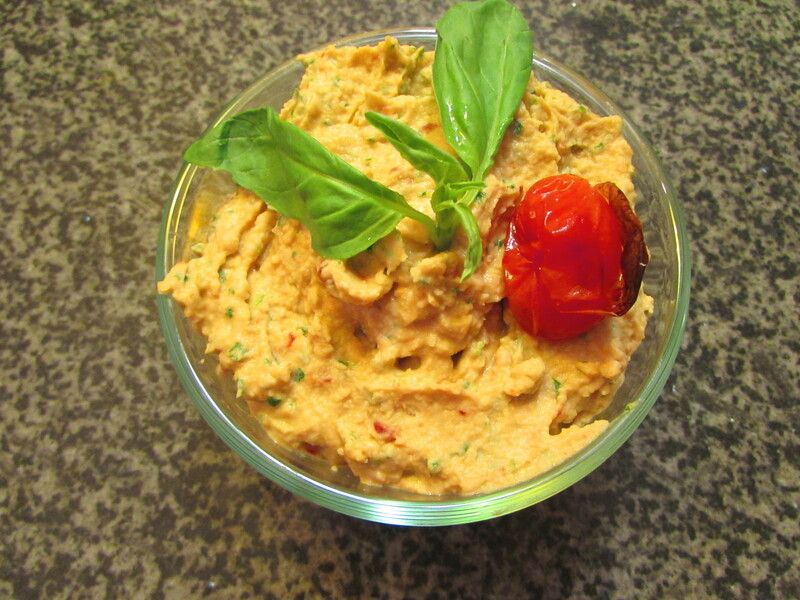 A combination of intense sundried tomatoes, zingy basil, and garlic, it will make you wonder why insert-mass-hummus-producer hasn’t already thought of this. Let’s get through the rest of this winter, guys. Hummus and socca in hand, I think we may be able to do it. (That, and maybe buying a bouquet or two of tulips at Trader Joe’s). Add all ingredients to a mini food processor. Pulse until smooth and creamy. Dig in! Combine all ingredients except olive oil in a medium bowl. 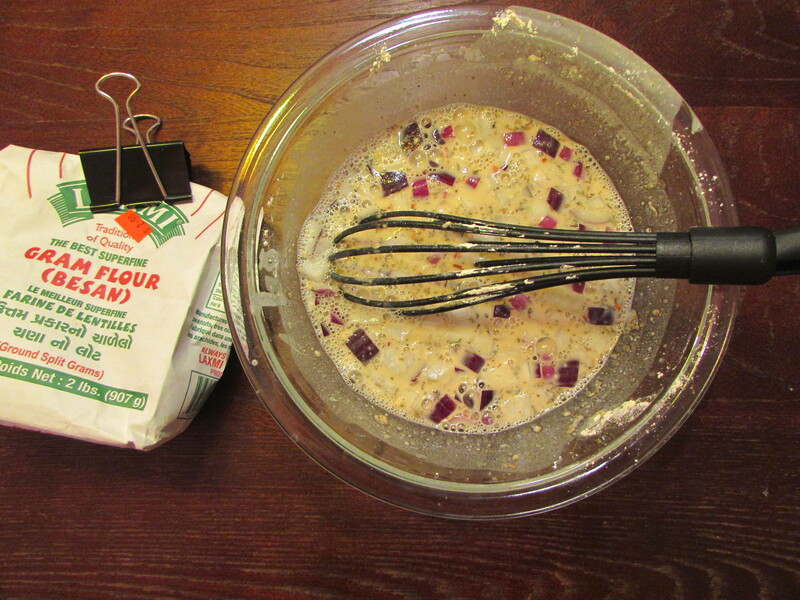 Whisk vigorously to get any clumps out. You can either make this on the stovetop, or in the oven. For the stovetop method: drizzle olive oil in a skillet or sautee pan over medium heat. When hot, add half the batter and spread over pan. Cook for 5-6 minutes. Flip, and cook other side for 5 minutes. Each side should be lightly browned when ready. Repeat to cook remainder of batter. For the oven method: Turn on broiler of oven. Put over-proof skillet under broil to warm up. After a few minutes, take pan out, and pour over a thin layer of olive oil (a tbsp or so). Add half the batter and swirl to cover pan. Place under broil for 6-10 minutes, until the top is a golden brown. Remove from pan, and repeat with remaining batter. 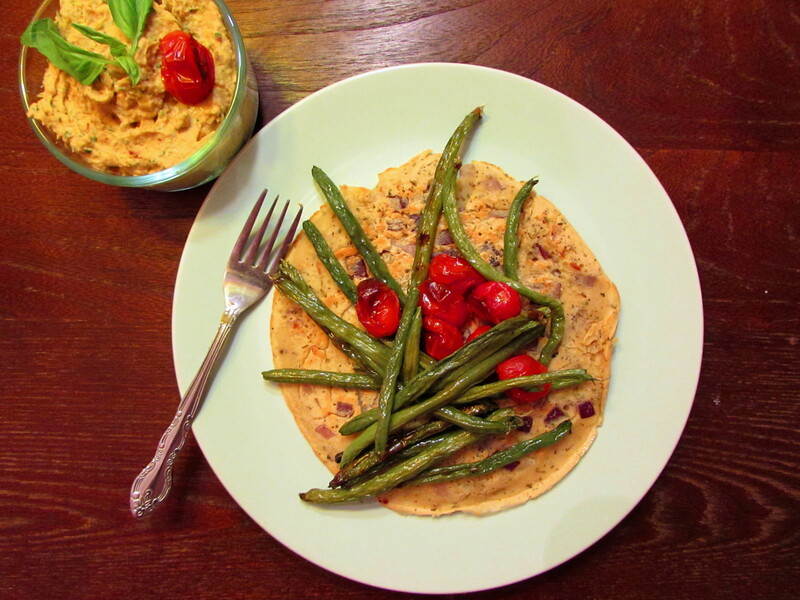 Serve each socca with a dollop of hummus, a glug of olive oil, and your favorite veggies.